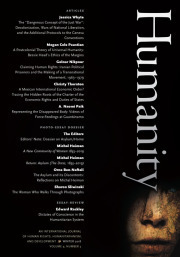 Our new issue contains a diverse suite of articles — Jessica Whyte’s fascinating engagement with the theme of Robinson Crusoe in debates around the Universal Declaration of Human Rights, an example with a rich earlier philosophical history; Johanna Siméant’s probing sociological examination of the rise of “advocacy” in international affairs; and Peter Slezkine’s breakthrough account of the origins of Human Rights Watch. They are joined by Greg Girard’s photo essay “Phantom Shanghai” and our regular essay reviews, including Laleh Khalili’s fabulous reading of recent books on counterinsurgent warfare and Patrick W. Kelly’s historiographical digest of work on Latin America and human rights. Interpreting the Rise of International "Advocacy"